Hey fellow Angelino! I don't know if you realize this, but we're all pretty spoiled to be living in this beautiful city. Aside from the perfect weather, we have access to pretty much any kind of terrain. You want a shoot in the desert? You got it. Mountains? Done. Forest? No problem. It's one of my favorite things about this city. Check out a few of my favorite places to do engagement shoots in the city. You probably wouldn't even believe half of these are so close to you! Tucked in the mountains north of Glendale is Switzer Falls, a beautiful hiking trail that leads to a waterfall. Along the trail are lush trees and an adjacent creek. If you're looking for some woodsy vibes, this spot is perfect! n the way to Switzer Falls are gorgeous views of the Angeles Crest Mountains, and there are plenty of spots to pull over and get some epic landscape shots. It's pretty unreal! If you and your partner love to be a bit adventurous, this spot is the one for you. f you're looking for more of an urban place that has some beautiful architecture, then Old Town Pasadena is perfect for you. There are so many historic buildings with unique design. (The building in this photo is a freakin' Post Office!) You can walk around the city for a variety of scenes, and end the shoot over at the Old Town Bridge. 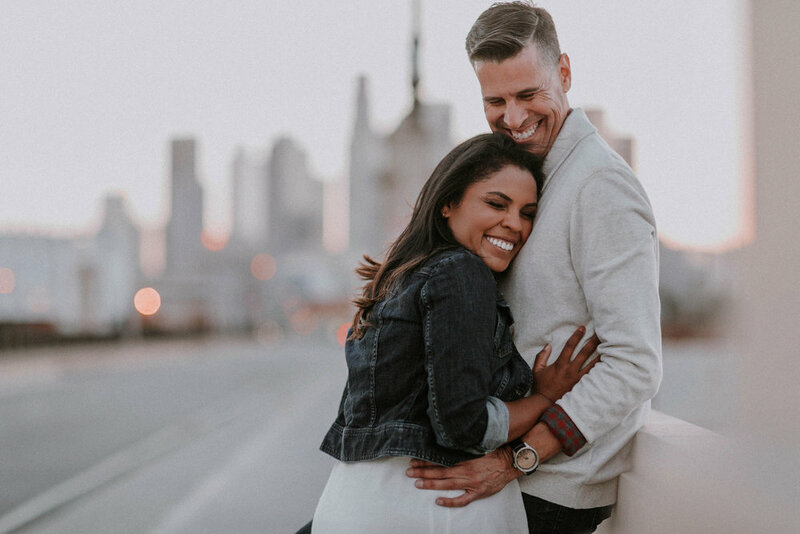 If you love LA as much as I do, then maybe the perfect spot for you two is right in front of the gorgeous Downtown Los Angeles skyline. There are a few great views of all the DTLA skyscrapers, but one of my favorite spots is on one of the number street bridges that go over the rail roads. A client favorite is The Bat Cave tucked away in Bronson Canyon. So many people aren't even aware this place exists. (I actually stumbled on it by accident!) Rest assured, it's one of the most beautiful locations to have your engagement photos done! There you have it! 5 of my favorite spots in LA and I've hardly scratched the surface. There are SO many beaches, coves, & hiking trails scattered throughout the city, and the best part is they are all within an hour or two away! Want more inspiration for your next photo shoot? Check out the rest of my work! If you're currently on the hunt for the perfect spot for you engagement photos, shoot me an email! What is the "First Look" and should you do it?